Jimmy Owens had been agonizingly close to winning the Late Model Nationals in years past. Whether it was not being fast enough, to mechanical failure, or just not being lucky enough. All that ended Saturday night when he led the final 59 laps to capture his first Late Model Nationals victory. Owens’ only real challenger during that span was Bobby Pierce who actually jumped the cushion in turn two and lost ground, then was taken out of contention when he spun coming out of turn four. Owens said after the race, he felt he was in control. Don O’Neal was second followed by Josh Richards to finish out the podium. The race was slowed by nine cautions and a red flag. A main (started), 100 Laps, NT: 1. 20, Jimmy Owens, Newport, TN (7); 2. 5, Don O’Neal, Martinsville, IN (4); 3. 1R, Josh Richards, Shinnston, WV (21); 4. 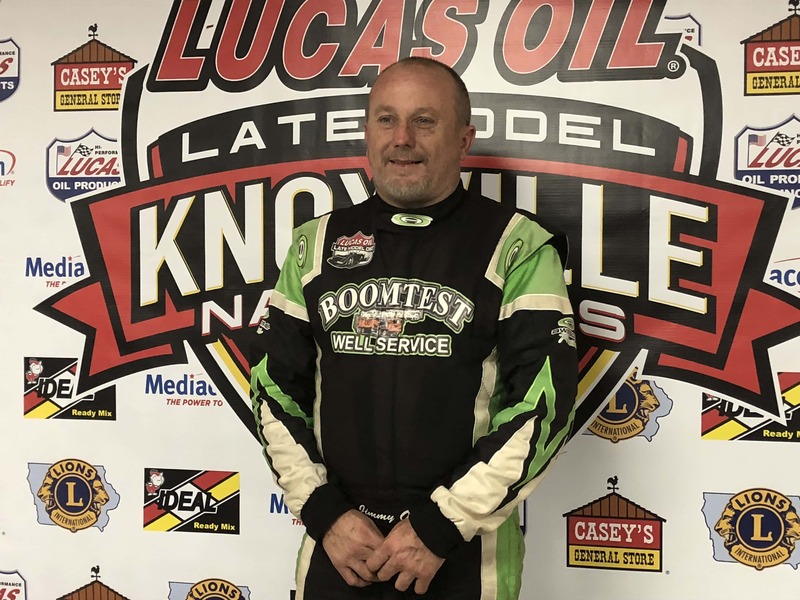 0, Scott Bloomquist, Mooresburg, TN (3); 5. Brian Shirley (27); 6. 1s, Brandon Sheppard, New Berlin, IL (1); 7. 32, Bobby Pierce, Oakwood, IL (22); 8. 91, Tyler Erb, New Waverly, TX (5); 9. 25s, Chad Simpson, , Mt. Vernon, IA (6); 10. 1, Earl Pearson Jr., Jacksonville, FL (2); 11. 49, Jonathan Davenport, Blairsville, GA (9); 12. Dennis Erb Jr. (26); 13. 99JR, Frank Heckenast Jr., Frankfort, IL (8); 14. 18J, Chase Junghans, Manhattan, KS (20); 15. Ricky Thornton Jr. (24); 16. 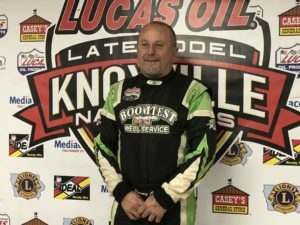 Darrell Lanigan (29); 17. 16T, Tyler Bruening, Decorah, IA (14); 18. 25z, Mason Zeigler, Chalk Hill, PA (18); 19. 76, Brandon Overton, Evans, GA (12); 20. 32s, Chris Simpson, Oxford, IA (10); 21. 21, Billy Moyer, Batesville, AR (23); 22. Jason Feger (31); 23. 18, Shannon Babb, Moweaqua, IL (17); 24. 25c, Shane Clanton, Zebulon, GA (15); 25. Greg Satterlee (30); 26. 39, Tim McCreadie, Watertown, NY (13); 27. 40B, Kyle Bronson, Brandon, FL (11); 28. 28M, Jimmy Mars, Menomonie, WI (16); 29. Jared Landers (25); 30. Scott James (28); 31. 30, Brian Birkhofer, Muscatine, IA (19); 32. 00S, Jesse Stovall, Billings, MO (32).